All teams must register through Advanced Event Systems (AES). Click the button below to be directed to the AES registration page. ACCEPTANCE CRITERIA: Acceptance criteria for this tournament is based on team performance relative to strength of field and rests strongly on performance history and strength of a teams’ competition schedule. The majority of the tournament field (80-90%) will be accepted prior to the Christmas holiday to allow teams to plan travel, etc. The final acceptances and complete tournament field will be set after MLK, Jr. weekend events have been concluded. Teams wishing to be considered for first round acceptances must have entered and paid by DECEMBER 15, 2018. TEAMS NEW TO MAPL: New teams, or those concerned about team acceptance, MUST COMPLETE a PRE-ACCEPTANCE SURVEY which is used to assist the MAPL Competition Committee with team acceptance criteria. FORMAT: This event is power-pooled to set up competitive matches from the start for all teams. SEEDING: Seeding will rely primarily on results as found in AES. It is each team’s responsibility to maintain their results in AES for seeding purposes. 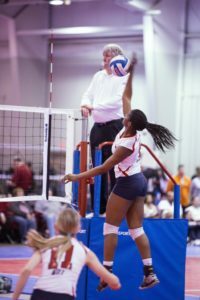 QUESTIONS: for more information regarding the Mid Atlantic Power League, visit www.maplvb.com. 1. Teams will not be considered for entry until payment is received. 2. Teams will not be accepted into the event until they complete the Hotel/Housing Survey. 3. Please make sure to enter all results into AES for entry consideration and seeding. 4. Registration closes on MARCH 16, 2019. 3. Rosters must be submitted before March 16, 2019.